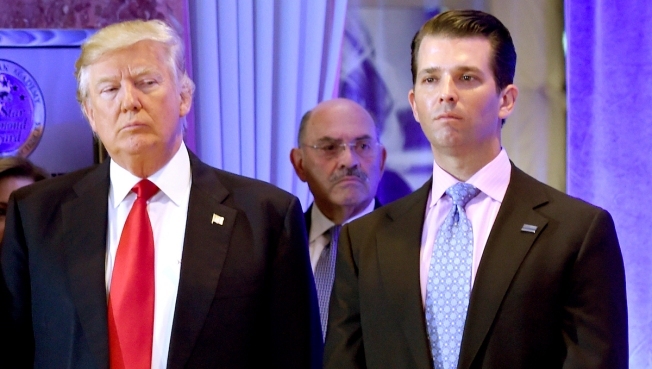 US President-elect Donald Trump along with his son Donald, Jr., arrive for a press conference at Trump Tower in New York, as Allen Weisselberg (Center), chief financial officer of The Trump, looks on. The House Intelligence Committee intends to call Allen Weisselberg, chief financial officer of the Trump Organization, to testify, a source with direct knowledge of the situation tells NBC News. The committee's intention to call Weisselberg was first reported by the Daily Beast. The move comes after Michael Cohen, President Donald Trump's longtime fixer, repeatedly cited Weisselberg as having firsthand knowledge of alleged financial irregularities in his public testimony before the House Oversight Committee on Wednesday. The chairman of that committee, Rep. Elijah Cummings, D-Md., also expressed interest in hearing from Weisselberg and other Trump Organization executives.